Minister Charlie Flanagan today praised the success of the Abhaile legal advice scheme, but did not indicate it would be extended to provide full representation. 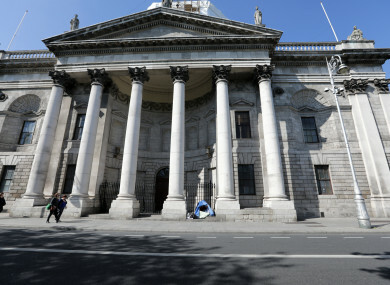 FREE LEGAL ADVICE Centres (Flac) has urged the government to make free legal aid available in proceedings involving the repossession of a home, as lay litigants struggle against the ‘sharp practices’ of vulture funds. The non-profit organisation made the call at the launch of its annual report which revealed it gave legal advice to almost 26,000 people last year. Flac also takes on a small number of cases each year where there is a wider public interest and last year there were 103 of these cases. Almost one third related to housing or landlord and tenant issues. The organisation acted in eight eviction proceedings and today Flac’s chief executive Eilis Barry said the courts need to have “greater flexibility” in these complex cases. “We have seen some pretty sharp practice at the hands of one particular vulture fund, which would not engender confidence in us going forward,” she told TheJournal.ie. There was one particular vulture fund who rejected viable payment proposals and sought immediate payment of the entire balance or repossession. Barry said she is anxious to see junior minister Kevin Boxer Moran’s Land and Conveyancing Amendment Bill pass through the Dáil. “The legislation, if passed, would give the courts an opportunity to look at a whole range of factors and possibly not make an order for repossession,” she explained. It was reported at the weekend that the European Central Bank may block this bill, but Minister for Justice Charlie Flanagan said today that he was confident the bill would progress. Although Barry said Flac had welcomed the introduction of the Abhaile scheme, which offers vouchers for consultations with solicitors to people who are in arrears, she said it is not enough to keep people in their homes. At the end of the day you’re not being legally represented when the hammer is coming down and we would feel that’s at a time of extreme vulnerability, where the consequences are so devastating, where there’s such a big power imbalance. She said people are “extremely distressed trying to represent themselves” and they call Flac looking for help, but the organisation is not in a position to provide representation to them. “I want to acknowledge the importance of the Abhaile scheme. It’s working particularly well. Of course in all circumstances it’s important that we would review, as well as monitor, and I’m very keen that we have the strongest possible legislation in order to ensure that those who are facing the trauma and upset and difficulty of repossession have available to them legal services. I’m very pleased with the success of the Abhaile scheme. If there are aspects of it that do give rise to concern I would certainly be happy to have a look at it. I’m also very keen to ensure that legislation is updated. “I’ve been speaking with my colleague Minister Boxer Moran in recent times, there is a draft bill that I’m anxious to have enacted over the course of the autumn. There is a legal issue with the attorney general and the ECB that I’m very keen to surmount before proceeding any further,” he added. Eilis Barry said access to legal representation could delay or prevent homelessness which would be a “cost win” for society “because the cost of homelessness, not just financially, is devastating for the family and for society”. Email “Call for householders to be given free legal aid to address 'power imbalance' during reposessions”. Feedback on “Call for householders to be given free legal aid to address 'power imbalance' during reposessions”.